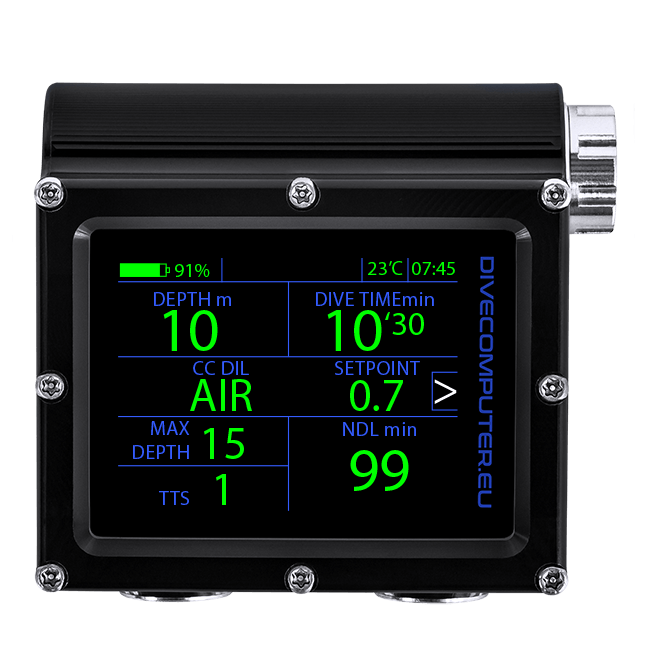 Screen containing the current time, pressure sensor and information about active gas and saturation of tissues. Setpoint value configuration and selection of active setpoint screen. Screen containing links to the device’s configuration / information submenus. Device and user identification information. Gas table configuration screen and selection of currently used gas. 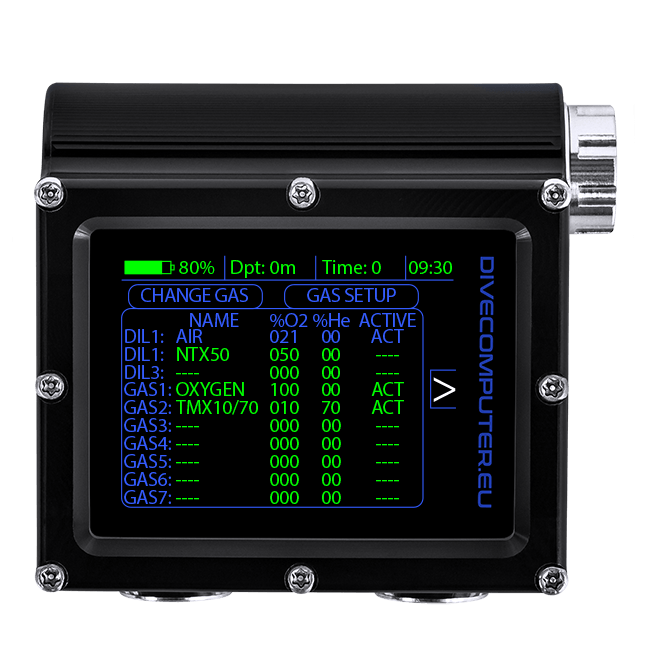 There are 7 gas mixes and 3 diluents available in CC mode. 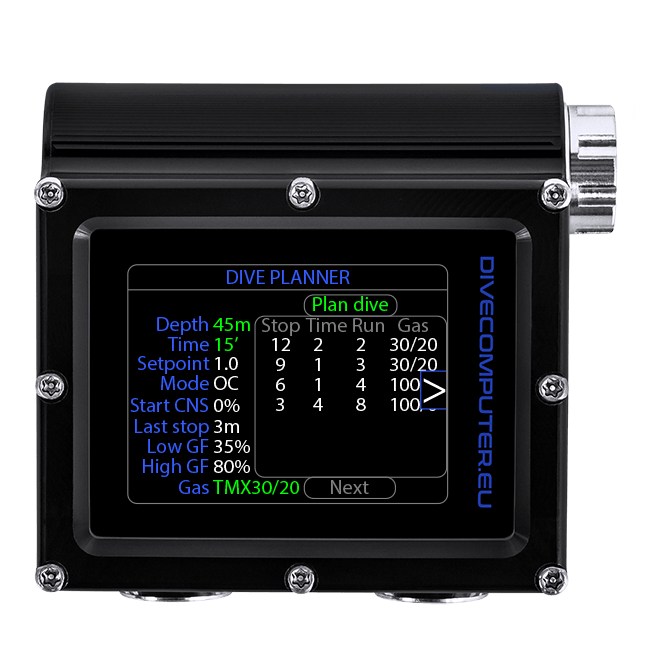 Configuration screen for dive parameters. 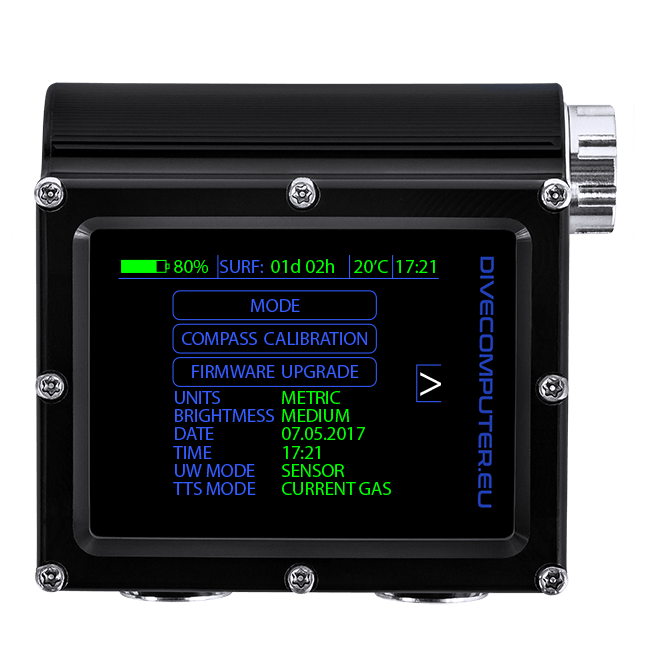 Screen of the dive planner – a function that calculates the decompression / optimal gas selection. 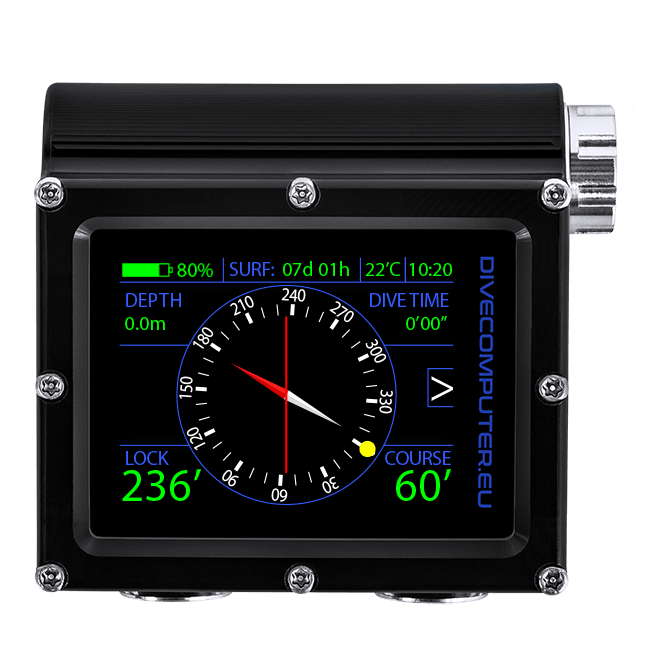 It enables calculating decompression stops and checking the correctness of gas selection. List of dives logged by the device. 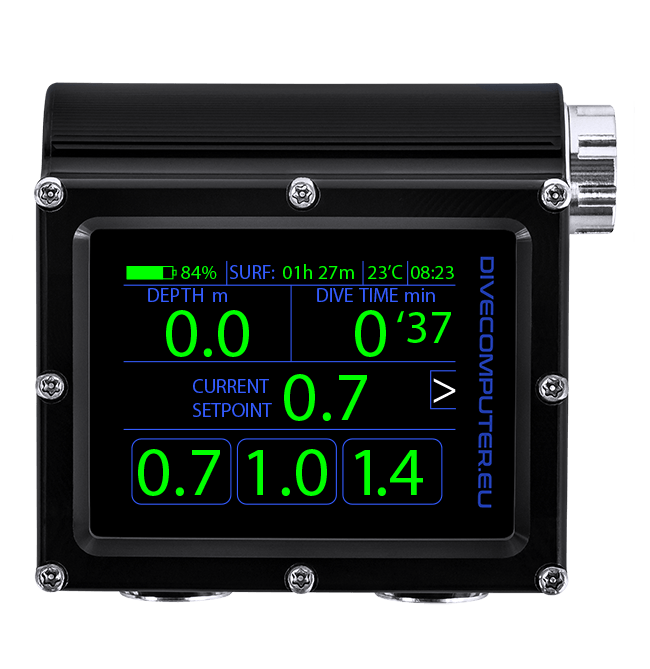 Screen with detailed information about the selected dive. 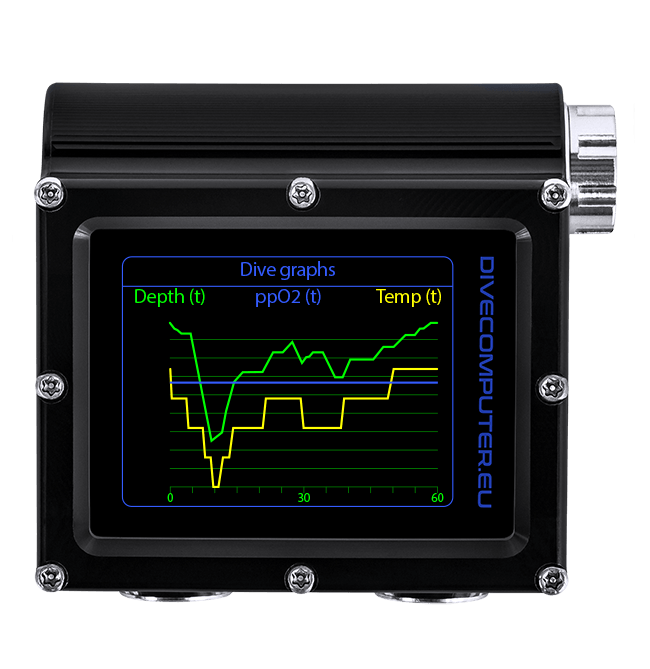 Graphs showing the dive process (depth, partial pressure of oxygen and temperature) over time. 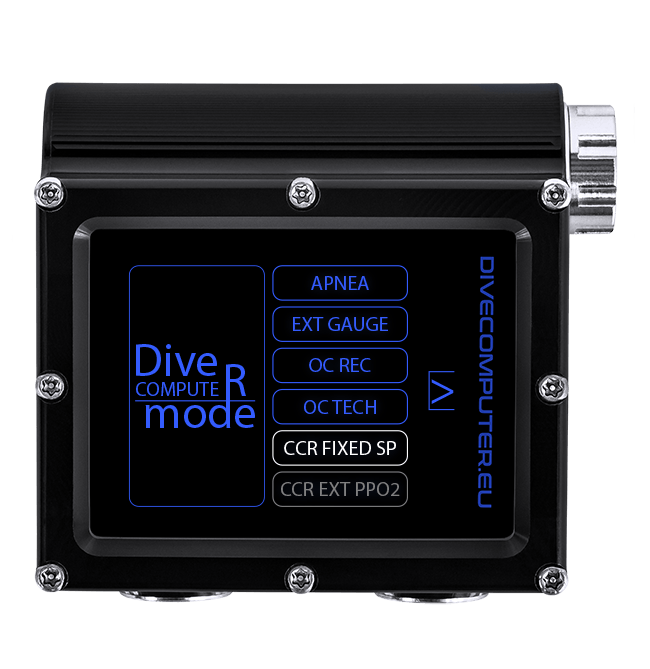 Screen for selecting the operation mode of the device. 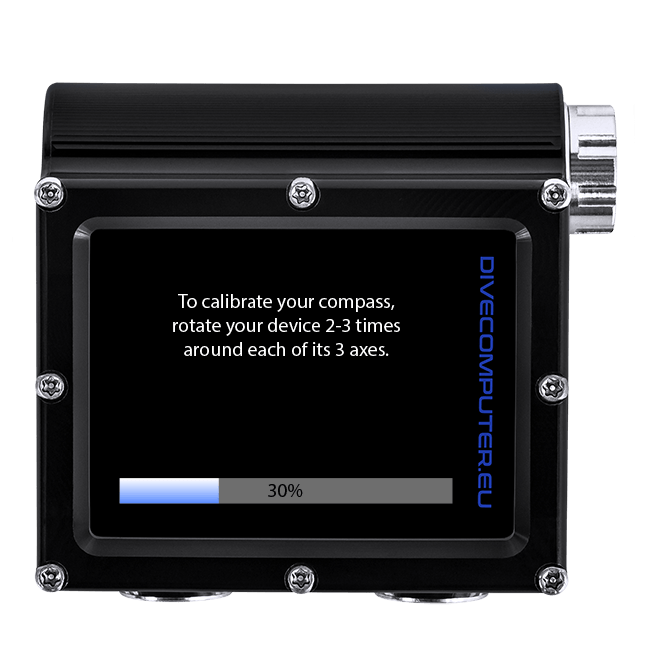 Calibration of digital compass built into the device. 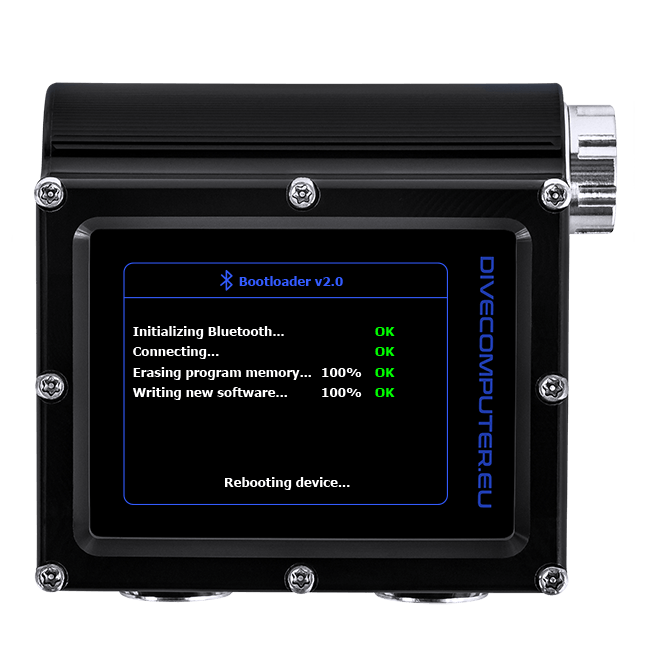 Device bootloader used to update the software. 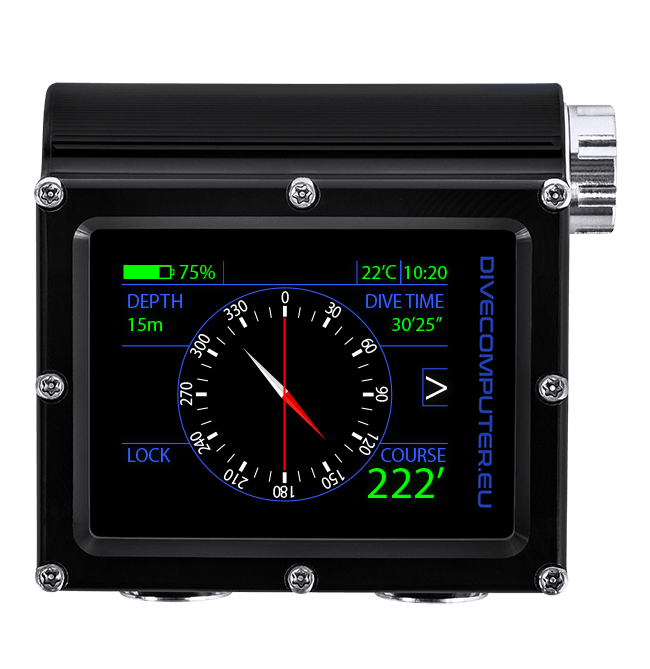 Display of current digital compass indications and locked course. 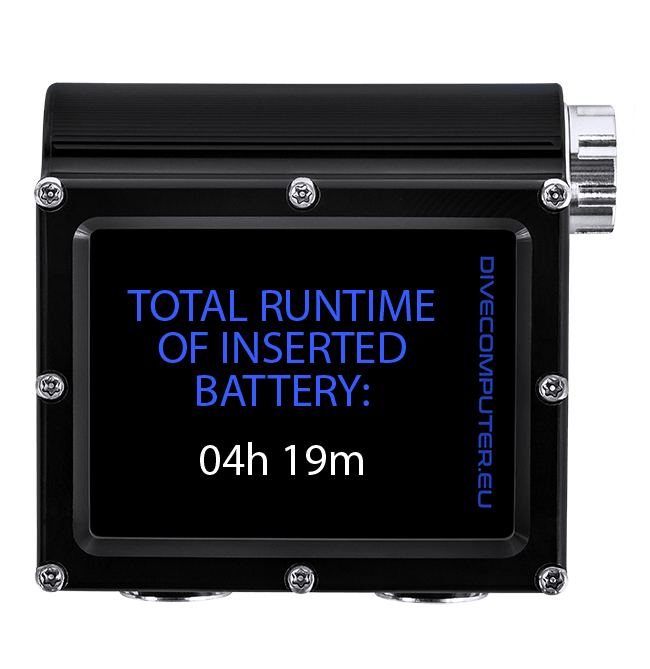 Information of the time the device is working on the last inserted battery. 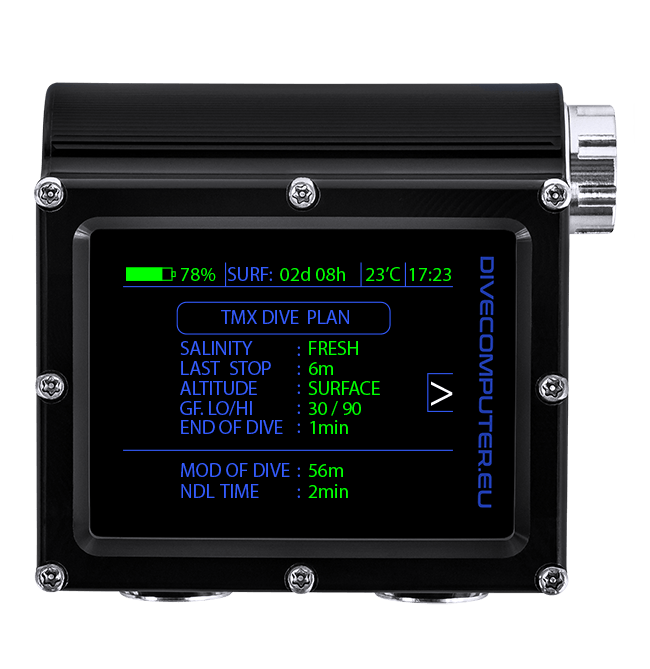 Screen containing current information about the dive and decompression information (nearest stop or remaining NDL time). Change screen for currently used gas. It contains a list of all active gases (“ACT” in the gas configuration table). The wrong gas for a given depth is displayed in red. 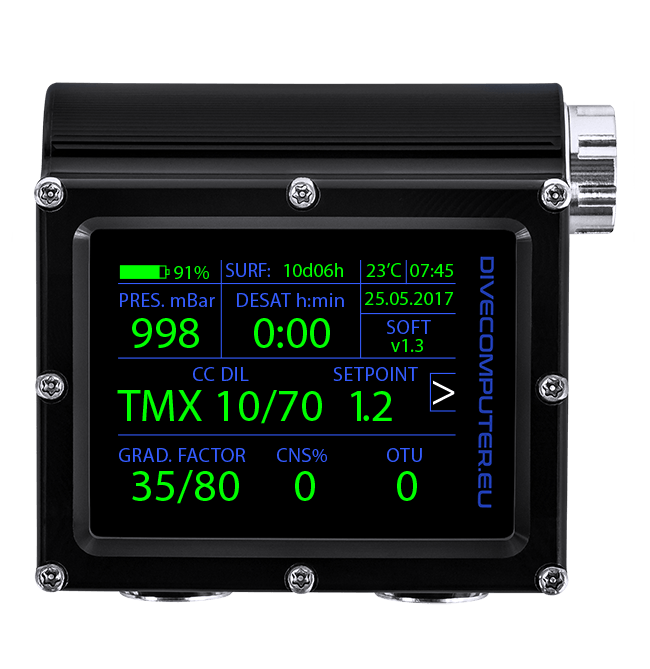 Screen of quick change of gradient factor parameters – in an emergency situation. 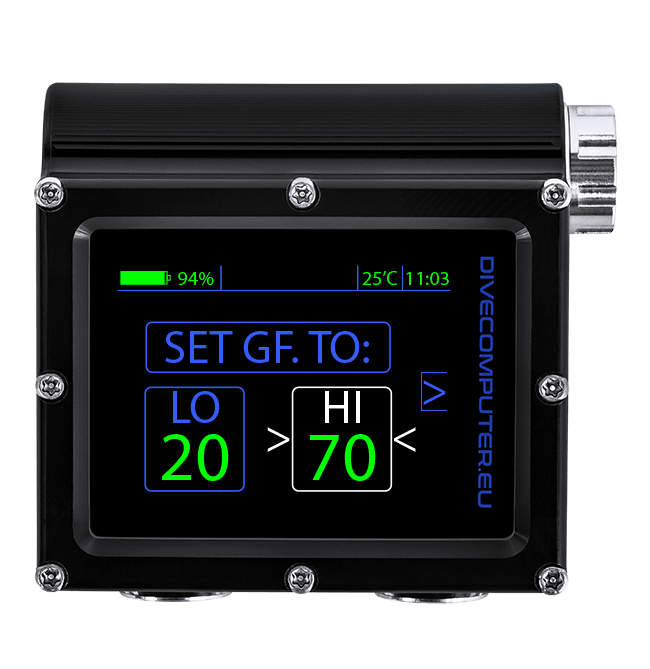 Default values gf lo / hi: 99. Gas table configuration and change of currently used gas screen. 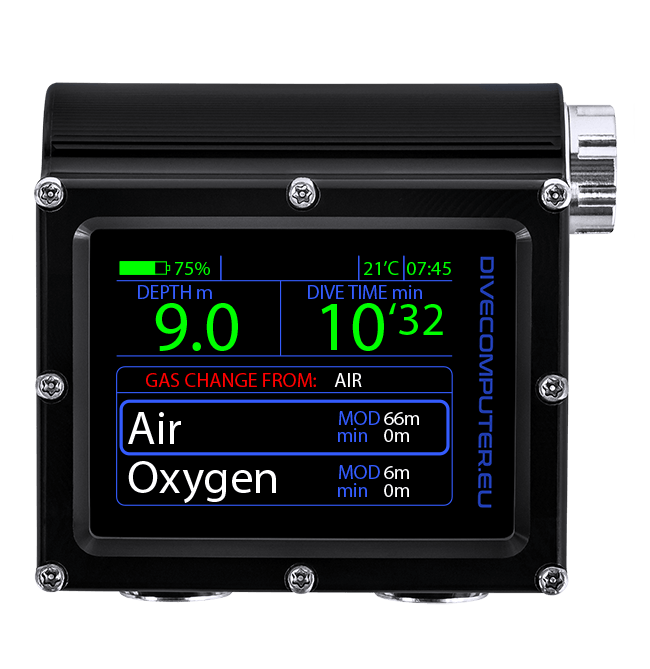 In CC mode, there are 7 gases and 3 diluents available.